Most Stats courses come with some sort of version of one or more lab assignment, in which the knowledge you have learned in class gets to be put to test by conducting a real Statistical analysis using a statistical software package. And that is the time, as far I have seen from my own experience, where the students will need help the most. Depending on the situation, the type of coursework covered and other factors, the software of choice could change. The most common choices are Excel, SPSS and R, followed sometimes by STATA and SAS, but those two last options are less frequent. Between Excel, SPSS and R, the differences are fairly clear and they have completely different purposes. Excel is a multipurpose software package that have some statistics features, but fairly tangentially to its multipurpose nature. SPSS and R, on the other hand, are powerful tools that can assist you in conducting powerful analyses. The main difference is that R is an open-source project that is free to use, but it mainly requires use of syntax (code) to be used, whereas SPSS is a paid tool with a robust graphical interface. 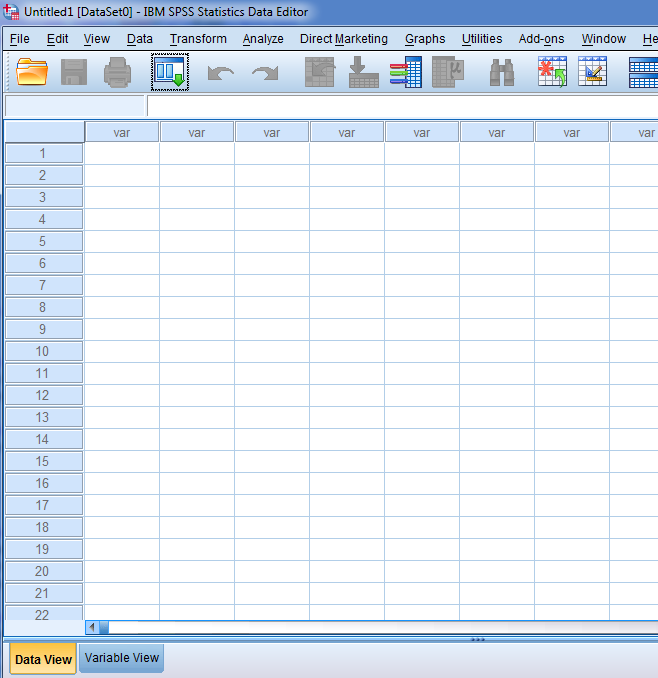 One could ask: why the heck anyone would use a paid software like SPSS instead of using something like R that is free? And the answer is not that simple: the use of syntax scares lots of people away from using R. Just to clarify, what I mean when I mention syntax is using a command line to tell R what to do, in a way that R understand what you are saying (which implies knowing all the rules and conventions involved in the corresponding syntax for R). So, it is cost-benefit thing in the end. Student SPSS licenses are relatively cheap, and they give you the advantage of not needing to deal with any kind of syntax at a cheap cost. Some people will pay for that because they think it is worth it, other people won't. So, the bottom line is that: you will need to think what is the most effective way of getting your task done, and sometimes paying a fee can be the best way, by quantifying costs versus benefits (on time saved). Now, it could well be that you don't have the option, in which case you will need to use whatever software package you are required to complete your assignment. Based on what our customers tell us, majority of times it is SPSS the software that they need to deal with. That is especially true in the case of Social Sciences, particularly in Psychology, where SPSS is the de facto tool students are expected to master. SPSS is not that hard to use, and it provides a fairly intuitive interface. Still, I can see that students will still need help with their SPSS assignments because on top of learning about how to use SPSS, they need to get their heads around the Stats content to make the magic work. I mean, before attempting to conduct a t-test analysis of SPSS, a student will need to have AT LEAST some basic understanding of the theory behind the t-test before using SPSS, at least in terms to be able to correctly interpret the results provided by the software. I commonly hear that people say that it is quite easy to use SPSS, until they need to interpret the results. This is actually very accurate. I feel that within a short time a student can get a basic hold of how to define the variables, how to feed the data into SPSS and how to navigate the graphical interface to get the statistical procedure that is required. BUT, when it comes to interpret the results obtained to answer the questions from the assignment, they feel that they don't know where to start. Interpreting and using only the required information provided by SPSS, in the form of the outputs provided by the results of a statistical procedure, is the more technical part of the whole process. There are some resources out there that can help you with that. Some books give some detailed explanations of how to read SPSS outputs (such as Advanced and Multivariate Statistical Methods), and also there are many great tutorials out there that go deep into providing annotated SPSS outputs. As its name suggests, that is giving explanations via annotations of what of the meaning of each of piece of information provided by the outputs provided by SPSS. It is crucial to gain understanding of the way results are provided by SPSS, because doing so will definitely help with greatly at the time of answering the questions from your SPSS assignment with concise answers, as it is usually required. Submit your SPSS problems for a Free Quote and we will be back shortly (a couple of hours max). It costs you NOTHING to find out how much it would cost to solve your problems. Our team is highly experienced in SPSS work, both with the GUI menus and syntax (indeed, what most people don't know is that most of the power of SPSS is in what can be done with syntax and CANNOT be done through the menus most people use. You can Request your Free Quote. We a have a satisfaction guarantee policy: If you're not satisfied, we'll just refund you. Please see our terms of service for more information about this policy. Why we can help with your SPSS?